The Regent Palace Hotel, another J Lyons hotel in central London. Built in the Beaux Arts style and opened in 1915. The building is a steel-framed structure, faced externally with glazed terra-cotta, the roof being covered with green slates. No less than 6000 tons of steelwork were required for the structure. There are nine floors above ground level, with a lower ground floor, basement and sub-basement. The main entrance is at the apex facing towards Piccadilly Circus. Here, one once entered through a vestibule into a circular lounge, lined with marble and having a richly embellished ceiling in the form of a shallow dome. 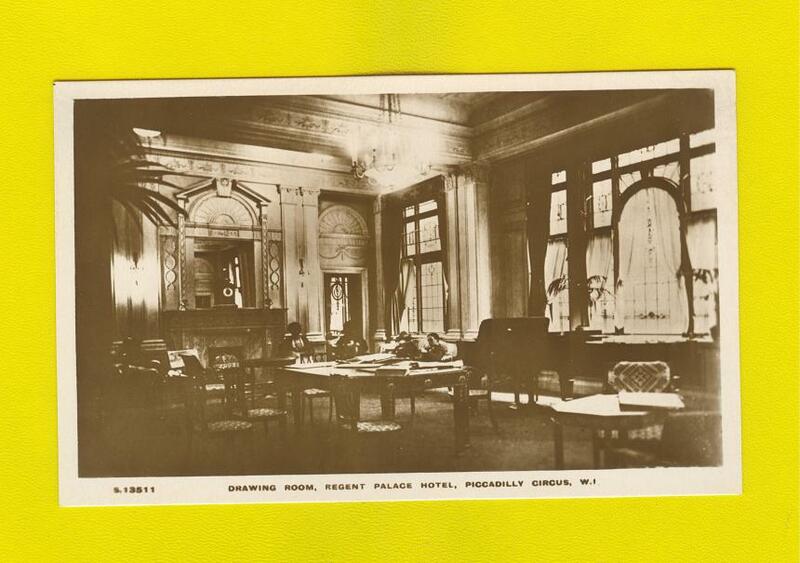 "The Reception Hall, Regent Palace Hotel"
The vestibule opened into the reception hall, on the one side of which was a staff counter and office, while on the other, was a marble staircase and three passenger lifts serving the various floors. Beyond, entered through the large swing doors, was the Rotunda Court. 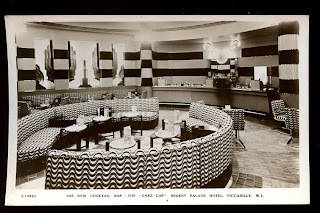 It had, over the centre, a large dome-light filled with stained and leaded glass and was seated with chairs and tables, which were chiefly occupied for afternoon tea. Opening out of the Rotunda Court was the Louis XVI Restaurant. The walls were of a light tone, with dark brown hangings to the windows. From one side of the Rotunda court access was gained to a corridor off which opened the general writing-room, and the Ladies’ writing-room, and at this point also were stairs leading up to the bedroom floors and down to the apartments on the lower ground floor, which include an immense grill-room, a smoking and reading room, a small palm court, and a billiard room. In the basement are the kitchen and kindred offices, and in the sub-basement the heating, ventilating, and power plant. 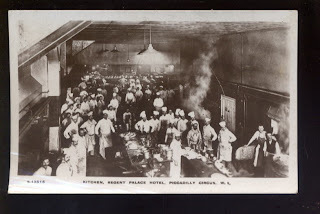 "Kitchen, Regent Palace Hotel Piccadilly." 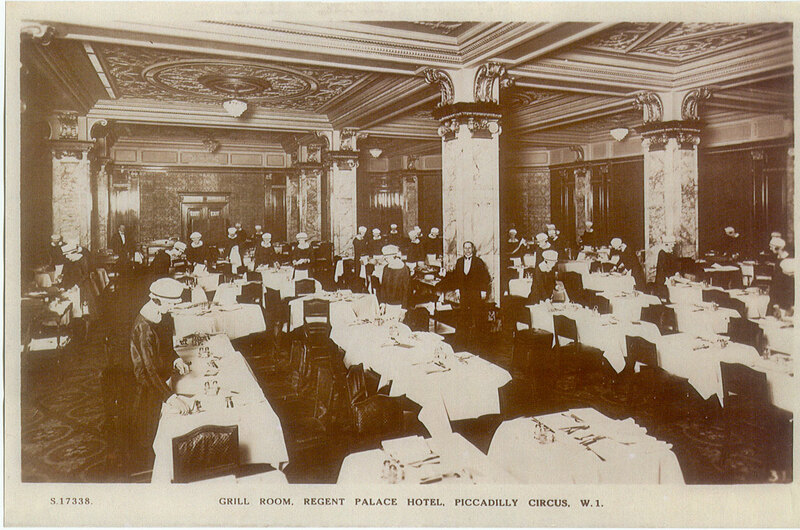 From the first floor upwards, the whole of the hotel was occupied by bedrooms, sitting-rooms and bathrooms. 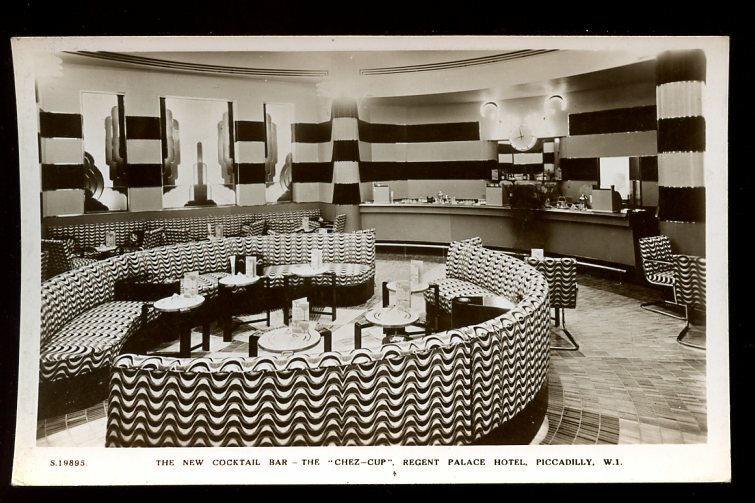 In 1934, the ‘Chez Cup, Bar’ under the entrance rotunda, was created in 1934 out of the former billiard room, and has been recreated in 2010 from the original architectural drawings.